OSWEGO, NY – Residents at Morningstar Residential Care Center filled the community room recently for their first Sit and Be Fit exercise class. 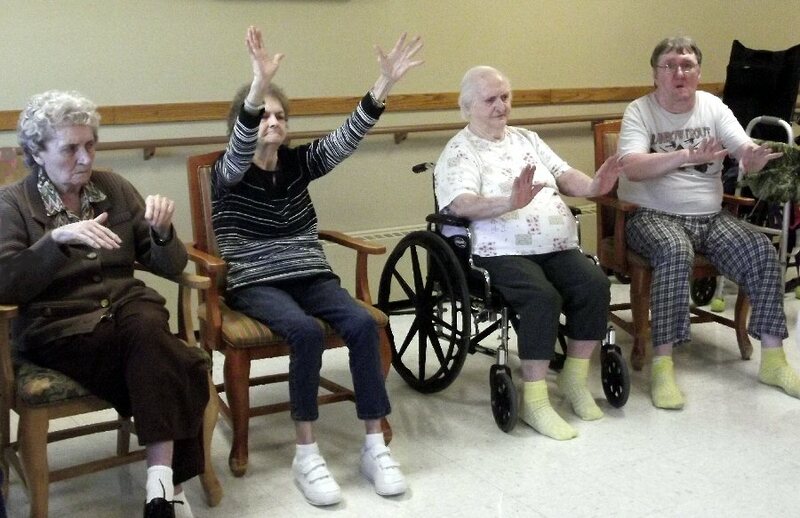 Lively music and a variety of chair exercises kept feet tapping and hands moving as the residents followed an exercise regime that was both challenging and fun. Residents at Morningstar Residential Care Center enjoy an arm exercise during their new Sit and Be Fit exercise class. From left are: Bernice Worden, Barbara Burke, Lois Getty, and Hank Racine. Physical activity and exercise is one of the healthiest things that one can do for themselves. Regardless of age, the benefits of regular exercise are many. Kelsey Rose, director of activities for Morningstar Residential Care Center, is well aware of that fact and was happy to introduce the Sit and Be Fit exercise class to Morningstar’s list of resident activities. According to Rose, all had a good time, and those that attended are looking forward to next week’s class. The positive response Rose received the residents regarding the Sit and Be Fit class has inspired her to consider adding classes such as chair zumba and chair yoga to the list of exercise activities available to the residents. “The health and wellness of our residents is among our top priorities and regular exercise is a fun and effective way to do so,” said Rose.